Why is the Fall Intramural League run as a non-competitive league? How do I sign up my child to play in the Intramural League? What are the deadlines for registering a child in the Intramural League? How can I register my child if I miss the May 1 deadline? When and where do the teams practice? How often are practices? What age must my child be to play in the League? What equipment is needed by my child to play in your league? May I request that my child be placed on a specific team or with a specific friend? How will I know what team my child is placed on? How are coaches chosen and what qualifications doe they have? How will I know if games are cancelled? How will I know if practices are cancelled? How are referees chosen and what qualifications doe they have? What is the League’s refund policy? How do I become more involved in the League or the Club? Why is the Intramural League run as a non-competitive league? 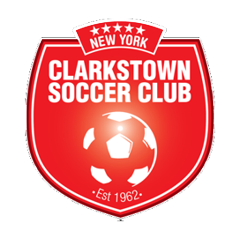 The Clarkstown Soccer Club has a number of soccer programs for youth including our Spring Development Academy and our Premier Travel Program, in addition to the Fall Intramural League. Our Intramural League is designed for those players that want to experience the fun and enjoyment of soccer in a program and environment that requires less commitment than more competitive programs, such as the Premier Travel Program. All players and the coach and an assistant coach receive a participation trophy and a team picture for Kindergarten to 3rd Grade and standings will be kept for grades 4th grade and up. We encourage players to attend all practice sessions as that is where individual and team soccer skills are developed that will increase a child’s enjoyment of the game. Registration is done exclusively through our on-line registration system which can be found on our web site. The on-line system will provide some benefits that we weren’t able to provide with the paper registration system we used in previous years. Specifically, the on-line system will allow us to accept payment via credit cards, and it will allow us to improve communication between the League and the coaches and players’ families. Our deadline for registration is May 15th. The early deadline is required due to the fact that with an Intramural Program of over 2000 children, it takes a considerable amount of time to enter each child into our database, assemble teams, set-up playing schedules, assign fields, assign coaches to teams, and mail the schedules and team rosters to the coaches. How can I register my child if I miss the May 15th deadline? Registrations will not be accepted after June 1. With an Intramural Program of over 2000 children, it takes a considerable amount of time to enter each child into our database, assemble teams, set-up playing schedules, assign fields, and assign coaches to teams. By early August we need to freeze rosters and mail the team rosters and game schedules to the coaches. Our season starts the first weekend after the Labor Day holiday and typically ends in mid-November. Teams play an eight game schedule, but games are not played on holidays and days of religious observance that may fall during the weekend. All games are played at Felix Festa Middle School. Games are played on either Saturday or Sunday. At the beginning of the season a team is given a schedule that either has all games on Saturday or all games on Sunday. Start times for games on both Saturday and Sunday are: 10:30 AM, 11:45 AM, 1:00 PM, 2:15 PM and 3:30 PM. The schedule that a team plays is based on the number of teams in each grade by gender and field availability. League schedules are distributed to the coaches in early August. The frequency, time, location and duration of team practices are determined by the team’s head coach. As our coaches are all volunteers, we allow them to set a practice schedule that fits their personal schedule and availability. We encourage coaches to hold three or four practices before the season starts and twice a week during the season. However, we understand that some coaches’ availability may not allow that many practices, especially after daylight savings time ends in early November. Most coaches hold their practices at the local elementary school (subject to the League obtaining permits) where the coach’s child and most of the players attend. Our League is based on grades rather than age. Children entering Kindergarten through twelfth grade in the fall are eligible to participate in our League. We require that all children wear shin guards and the league uniform to play in the league. The league uniform consists of a red/white reversible jersey, white shorts and red soccer socks. You may order and purchase the complete league uniform or uniform parts at registration. All uniform orders for a team will be given to the team’s head coach just prior to the start of the season for distribution to the players. Note that we use the same uniform each year so it you may want to consider buying a larger size so that your child may get two seasons use from it. Also players with older siblings may be able to re-use uniforms that the older children have outgrown. During the first two weekends of the start of the season, we will have a league representative available at the fields to exchange uniforms if there are problems with sizes. Shin guards may be purchased from any sporting goods store. The shin guards should be the correct fit for your child (cover the shin from a few inches below the knee to a few inches above the ankle) and are to be worn under the soccer socks. Although not required, we strongly recommend that children also have rubber cleats, a soccer ball for practice and a water bottle. Rubber cleats are recommended as the grass fields can get slippery. Most coaches will ask that their players bring a ball to practice. The league uses a size 3 ball for K-1st grade, a size 4 ball for second to sixth grade, and a size 5 ball for seventh grade and above. We recommend that if you are purchasing a soccer ball that you mark your child’s name on the ball with an indelible ink marker. Teams are formed based on grade and gender. However all high school players of the same gender will play together. As teams in the same grade and gender play against each other in the League, we always try to establish an even number of teams in each group to avoid teams having byes. Ideally, we would like to have our small-sided teams (Grades 1 -3) which play 8 v 8 have a roster size of 14 players and our large-sided teams (Grades 4 -12) which play 11v 11 have a roster size of 18 players. That allows a team to have enough players for each game, let each child play a minimum of half the game, and give the coach some flexibility to reward skill or commitment with more playing time. Maximum roster size is 16 for small-sided teams and 22 for large-sided teams. Additionally, we try to form teams by the elementary, middle school,or high school attended by the players, so that children may play with their school mates. In some cases where there are more players in a grade from a single school we will have two or three teams from that school. In other cases, we may not have enough players in a single grade from a school and players from one school may be combined with one or two other schools. We always try to place a child with at least two or three other school mates. We generally try to keep teams that are formed in first grade together as they progress through to the older grades. Of course some players do no not return each year and new players are added. Also, in some case we combine two teams when neither team has enough returning players. Played on the team the last season. Attends the same school as the team and requested placement on the team last season, but was denied. Attends the same school as the team and are new to the league. Attends a different school and requested placement on the team last year, but was denied. New to the league and attends a different school. Players registered late for the season. By mid-August you should receive a call from your child’s coach. The League distributes team rosters and schedules to the head coaches in August. The coach will let you know the first practice that he or she plans to hold. At that practice or subsequent practices the coach will distribute the roster and game schedule to the entire team. The coach will distribute any ordered uniforms or uniform parts to the players that ordered them at a practice just prior to the start of the season. If you do not receive a call from a coach by mid-August you may log on to the registration system using the same email address and password that you entered for registration and you will be able to view your child’s team roster including the coach’s name and contact number. How are coaches chosen and what qualifications do they have? All of our coaches are volunteers. We do not require our coaching volunteers to have any soccer coaching or playing experience, but any experience would be a plus. The requirements for coaching are: must be a parent or legal guardian of a child on the team; must have the time to attend games and run practices; must be good working with and instructing children; and must be enthusiastic about the game of soccer. Additionally, in order to provide a reasonable level of safety and security for our players, all coaches must enroll and pass a background check conducted by Eastern New York Youth Soccer Association (ENYYSA). ENYYSA is a member of the US Soccer Federation and one of our Club’s governing organizations. In some circumstances, we have selected coaches for a team where the coach does not have a child playing, but in these cases, the coach has previously coached in the League or participated in another Club program. In some cases, where two teams have been combined from previous seasons, we will select co-coaches and ask that the co-coaches work together and cooperate in running the team. During the course of the season, the League administrators will observe the action and behavior of coaches. Additionally, the League will get feedback from referees and parents of behavior that falls outside of the rules and goals of the League. In those cases, the Intramural Coordinator will investigate and take appropriate action based on the policies of the Club. Decisions on game cancellations will be made by the League. We use Felix Festa athletic fields by permit, and thus we must abide by their decisions regarding field closures due to weather or other reasons. Note that although the weather on the day of the game may be bright and sunny, the school may close the fields if they are still wet and soggy due to previous days’ rain. If games are cancelled we will attempt to call your coach via a call out system provided by CallingPost.com. Once notified the coach should inform his or her team of teh cancellation. We will also place an announcement on the League’s hot line 845-639-6123. If games are cancelled and you call the hotline you will hear a message announcing the cancellation and any make-up information. Please hang up before the message greeting ends so that other families calling can hear the same message. The hotline is a voice messaging system that may fill up if families do not hang up on time thus preventing others from hearing the message. We will also try to update the Club’s web site at www.cscssoccer.org if games are cancelled. However, sometimes we are unable to get our web site updated in a timely fashion to reflect the cancellation. Team coaches are responsible for notification of practice schedules and any cancellations of practice. Coaches may choose how they communicate with their team. Most coaches use telephone chains or e-mail distribution. You may want to discuss this with your child’s coach at the beginning of the season, if the coach does not address it on his or her own. All of our referees play or have played with our Club in either the travel program or the intramural program. They must be at least thirteen years old and may only referee games involving children that are at least three years younger than them. All of our referees are licensed and have taken a refereeing course of 18 hours and successfully passed the US Soccer Federation (USSF) Referee’s Exam. We will refund the registration fee and the cost of any uniforms ordered less a $20 administrative fee for refund requests made on or before August 1. The August 1 deadline is set as that is the date we typically set all rosters and schedules and start mailing out to the coaches so they can call their players’ families and introduce themselves as their coach. The $20 fee is to cover the administrative cost of registering the child, removing the child from our data base, canceling uniform orders (if requested) and then processing the refund request. Please allow approximately three to four weeks to receive a refund check from the date of your request. Call us on our hotline 845-639-6123 or e-mail us at intramural@cscsoccer.org . We can tell you where we need assistance or you can tell us what skills you have or what you may be able to do. We welcome your involvement regardless of your knowledge or experience with soccer.